Hozier's Guitars | Rollout and No.1 debut for Wasteland, Baby! Hozier had fans on their toes in March as he launched his highly anticipated sophomore album, Wasteland, Baby!, and hit the road for a jam-packed promotional tour. We round up the highlights. March 1: It’s release day, baby! Released at midnight, the 14-track Wasteland, Baby! features singles Nina Cried Power, Movement and Almost (Sweet Music), and stunning artwork painted by Raine Hozier-Byrne. A very wet Hozier revealed the creative process for the cover art in a cracking behind-the-scenes video starring his mom, Loftus Hall and a blow-up unicorn. Hozier celebrated the album launch with a YouTube release party, live from New York, in which he sat down for an in-depth Q&A before an intimate set featuring Movement, Almost (Sweet Music) and the title track, Wasteland, Baby! With the record in stores, Hozier hit the ground running. His promotional tour started bright and early on March 2nd with a 3-song Saturday Session on CBS This Morning. Watch the first US TV performance of Almost below, and check out Nina Cried Power and Movement. Then it was time to sign some records, baby! Hozier popped into Vintage Vinyl Records in New Jersey on the 2nd and had fans queuing around the block in Brooklyn at Rough Trade NYC on the 3rd, despite the snow storm. March 4th promo events got rolling with a live set from Times Square on Good Morning America. Don’t miss the passionate performance of Movement. 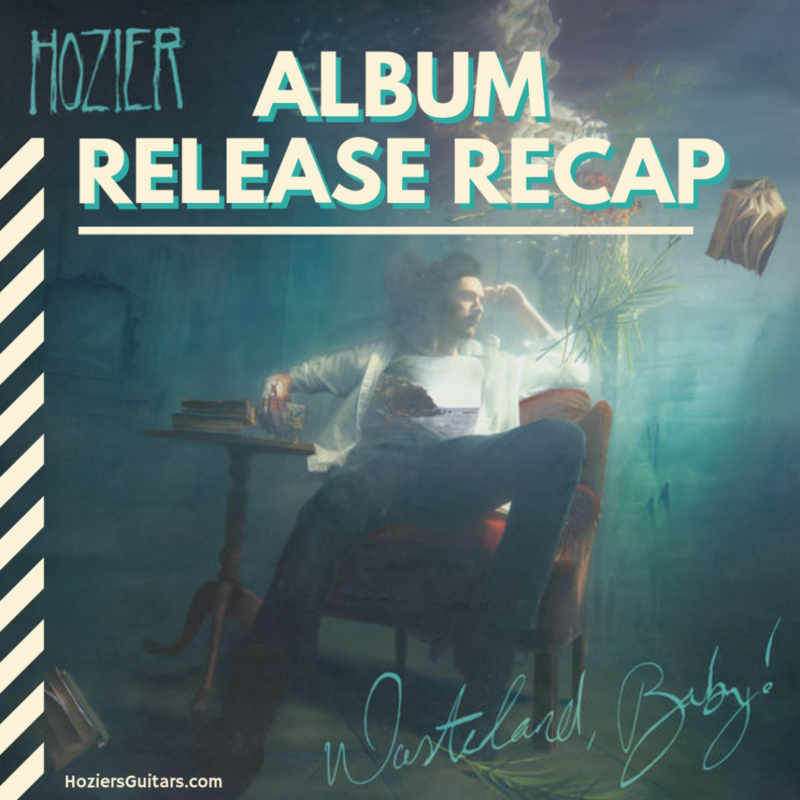 For fans soaking up new music, it’s always a massive bonus to learn about Hozier’s creative process, and Sodajerker came through when they picked his brain about writing and recording Wasteland, Baby! The podcast is a must-listen. Earlier today we released episode 132 of the podcast featuring the excellent @Hozier talking about his new record Wasteland, Baby! and some tunes from his debut, including the colossal hit 'Take Me To Church'. Though we wonder just how “idle” he could have been during a whirlwind album release week, Hozier found some time to chat with fans in an impromptu Twitter Q&A. We’ve rounded it all up for your reading pleasure. Bringing Wasteland, Baby! to late night television, Hozier performed Almost (Sweet Music) on The Late Show with Stephen Colbert, where he crossed paths with Game of Thrones star Kit Harrington. To top off an eventful day, Hozier released the fantastic music video for Dinner & Diatribes, directed by Anthony Byrne, who had previously lent his talents to the video for Someone New. Titled ‘A Seat at the Table’, the gorgeous production features Anya Taylor Joy and fulfills Hozier’s dream of being set on fire. March 6: Next stop, Wasteland, Baby! On the evening of March 6th, fans received news that stopped them in their tracks. Hozier and his band had descended upon the NYC subway for a set of tunes. Take Me to Church, Almost (Sweet Music), Movement, Work Song and Nina Cried Power were getting their live subway debut. Missed it? Fear not. Here’s the entire set. For Spotify users who might not have caught it, Hozier also released a fun video for Almost (Sweet Music) filmed on a windy day in New York. He subsequently published the video on YouTube. What better way to start off your day than to get a Wasteland, Baby! shoutout from U2? How do you follow a debut album like #Hozier like @Hozier just did? Ahead of International Women’s Day, Hozier joined forces with a host of other artists in a campaign led by Annie Lennox to support Global Feminism. Capping off a monster week, Hozier lent his voice in aid of God’s Love We Deliver with a rousing set at the annual Love Rocks NYC. The incredible lineup featured Robert Plant, Sheryl Crow and a house band packed with legendary players. For his third and final song, Hozier was thrilled to welcome on stage the amazing Mavis Staples, who joined him in a stirring rendition of Nina Cried Power. No rest for the wicked. On International Women’s Day, Hozier was in brilliant company for the filming of the new music video for Almost (Sweet Music). And a very special week was just getting started as news was announced of the album’s chart-topping debut in Ireland, with three tracks entering the Top 50 singles chart (Almost, Movement and To Noise Making). Hozier expressed his appreciation to his compatriots in a video message. To date, Wasteland, Baby! has claimed three weeks atop the Irish Albums Chart. March 10th brought with it the truly spectacular news: Wasteland, Baby! had debuted at the top of the Billboard 200 Albums Chart. Hozier shared his reaction to the news in a moving message of thanks. Later, he would reveal his surprise at the news in a Billboard podcast. 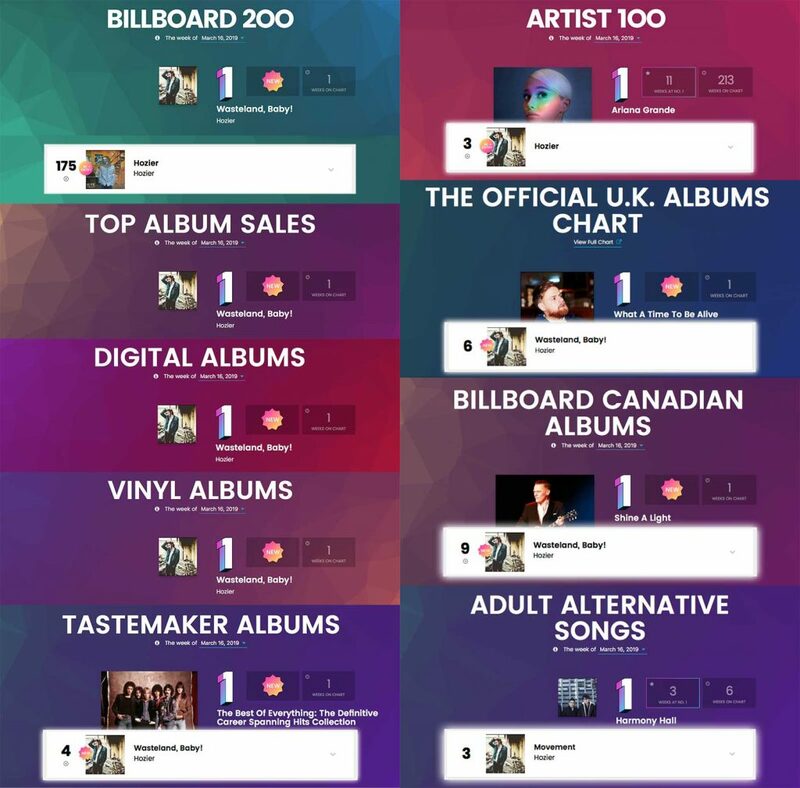 In addition to claiming the Billboard No.1 spot in its first week of release, Wasteland, Baby! also topped the Album Sales, Digital Albums and Vinyl Albums charts for the week. It came in at No.6 on the official UK Albums Chart, at No.9 on Billboard’s Canadian Album Charts and at No.4 in Tastemaker Albums. Of the single releases, Movement had taken the No.3 spot on the Adult Alternative Songs chart. That very evening, Hozier’s Wasteland, Baby! Tour kicked off in Buffalo, with the “blistering” talent of Jade Bird as opener, and we can only imagine the electricity on the stage of Shea’s Performing Arts Center as this talented Irishman announced the news. Heartfelt congratulations from Hozier’s Guitars to Hozier on a magnificent return, and to his mighty team on a fittingly spectacular launch! Special thanks to Hozier’s Guitars contributors @Megn0481, @literarypengke, @AInabsentia, @aenroute, @FYeahHozier, Biljana J, and more. Want more from Hozier’s Guitars? Follow us on Twitter, Facebook, Instagram, and Tumblr. Also, join us on r/Hozier on Reddit. Featured image: [Wasteland, Baby! album cover]. Graphic: Hozier’s Guitars. Tagged Almost (Sweet Music), Annie Lennox, Beacon Theatre, Behind-the-scenes, Feminism, game of thrones, gma, good morning america, got, Hozier, Interview, kit harrington, late show, loverocksnyc, Mavis Staples, Movement, Nina Cried Power, nyc subway, Raine Hozier-Byrne, record signing, Robert Plant, Rough Trade NYC, Sheryl Crow, sodajerker, Spotify, stephen colbert, wasteland baby, Women's Day. Bookmark the permalink.